How do you make the shooting sports even more fun? Federal's got the answer: Add strippers! 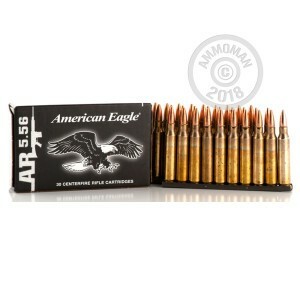 Made in the same government factories that supply US military forces, these 5.56 NATO rounds, sold here in a case of 900, come pre-loaded on 10 round stripper clips for easy insertion into most AR-15 magazines such as the venerable USGI and ever-popular PMAG designs. Produced by Federal Premium Ammunition in its capacity as the private contract operator of the Lake City Army Ammunition Plant in Independence, Missouri, these rounds follow the M193 ball standard (55 grain full metal jacket bullet, 3,240 feet per second of muzzle velocity) and are highly prized among shooters for their military pedigree. These 5.56 NATO rounds use non-corrosive Boxer primers and reloadable brass cases and are ideal for use in any AR-15 rifle. They may not be compatible with all .223 Remington firearms. This order ships for free, as do all orders at AmmoMan.com that total over $99. At AmmoMan, there are no hidden shipping fees for bulk orders!